So, what do we make of this ? The rumor is that Apple is launching a record label together with Jay-Z according to BSG who say they have confirmed it from a high-up person attached to Jay-Z. We do not have many details as of yet but we can make some assumptions. The deal makes perfectly sense if you consider that Apple already has a very popular distribution model in place which would profit the most from artists that sign under the new label. 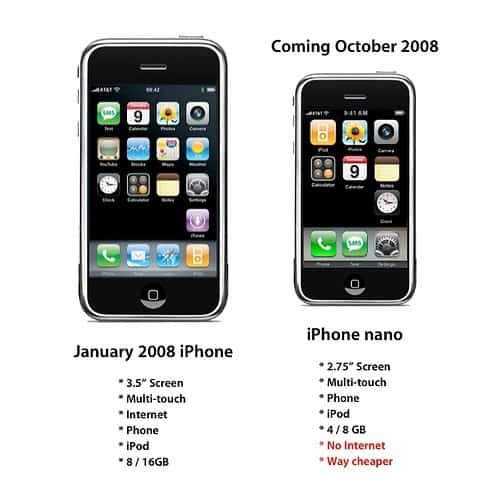 A picture comparing Apple's iPhone with the iPhone Nano which is supposed to come out in October 2008 was published on Flickr. The iPhone Nano, as usual, will be smaller than it's first generation predecessor but also cheaper retailing for a price of $300 or less. If you have one of the newer iPods with 8GB+ you might want to consider putting all the information of Wikipedia on it for fast reference. I personally think that this is an excellent idea if you regularly visit Wikipedia to research information but do not have Internet connection all the time. This could also be useful on your holiday trip if you want to quickly lookup information about a place, location or historical fact. Amazon Subscribe and Save was mentioned in the Cybernet News RSS feed and it sounded that interesting that I decided to take a look at it myself and write a small article about it. The service offers a way to subscribe to household items and select a delivery schedule for those items. Shipping is free of charge and buyers do get a 15% discount on purchased items. I always wondered which company would be able to compete with Apple's iTunes store and only a handful companies came to my mind. Besides Microsoft and eBay Amazon came to my mind. They are a established brand and I do not know a single person who does not have an Amazon account already. Frozen iPods are more common than you might think. Read on before you go out and buy a new iPod just because you can't get your old one fixed. As I said, frozen iPods are common and there are a few steps that you can undertake that will most likely fix the iPod and get it out of it's frozen state. Apple announced new iPods. Does anyone care? Apple once again announced a new batch of iPod devices to lure consumers in the trap of buying just another iPod that can store more Gigabytes, is smaller or offers a touch screen interface. High-End users have the choice between a 8 and 16 Gigabyte iPod Touch which looks pretty similar to the iPhone but ships without phone capabilities or between a 80 and 160 Gigabyte iPod Classic device. NBC wants more control on pricing and usage restrictions while Apple did not want to give in which is why the current relationship between those two is a little bit icy and it remains unclear if NBC shows will still be available in iTunes at years end. Meanwhile Amazon and NBC announced that NBC's tv shows will be made available on Unbox. I did not pay much attention to the Apple iPhone hype until now but today the newest commercial for the iPhone caught my attention on Youtube. The first thing that struck my mind was that the navigation was blazing fast. As you might know a multi-touchscreen is being used for writing and navigating through menus. It looks more like a multimedia gadget with phone capabilities than the other way round which I personally do not like that much. I like slim, fast gadgets that are not that bloated than the iPhone. I would never for instance watch Youtube videos on such a Gadget, does not make sense to me. Apple and Emi announced today that the entire digital repertoire from Emi music can be purchased at Apples iTunes store without DRM. The songs will be offered at a higher quality which means an encoding quality of 256 Kbps instead of the usual 128 Kbps. There is however one downside: The DRM free songs cost $1.29 per song instead of the usual price of $0.99 per song. I'm a little bit concerned about the 30% increase which can not be explained rationally I think. Albums on the other side will not change in prices at all which makes the single song price increase a mystery to me. Amazon offers a huge product catalogue on their different (country) websites which has one major problem and that is clarity. Navigating through the content can be really painful, especially if you only want to check the current price of several items that you would like to buy. One way to handle this would be to store all products as bookmarks and check them manually every day to see if the price was reduced. This is however not very practicable. The free Amazon Price Watcher aids you in this task. 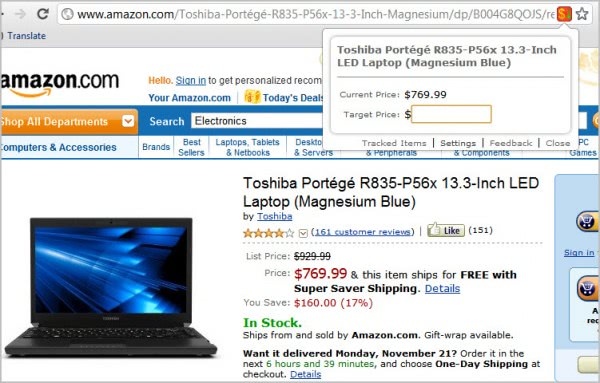 It allows you to search many Amazon stores - including those for the United States, Great Britain, Germany and Canada) - using the Amazon Price Watcher interface. Just search for products in selected categories and save interesting results in a library. The library offers fast access to information such as price and availabilty including a price chart which displays the overall price trend. We already know that most iPod can store various information next to music and videos. Wikipedia can be uploaded as well as information about subways in various citys. The iPod city guide is another excellent application for most iPods, including iPod Nano and iPod Video, which adds information about more than 300 cities to your iPod. This is a funny story I read on the World of Warcraft forums. A guy who is playing World of Warcraft was on his flight from the United States to Canada to meet some of his fellow clan members. He used the toilet on that flight and witnessed afterwards that the stewardesses were acting strangely. Something seemed to keep the toilet from flushing. The guy immediatly thought it was his fault but decided not to tell them because of this embarassing situation.